This year, Kawasaki has been redesigned Kawasaki Ninja 650R in Texas. 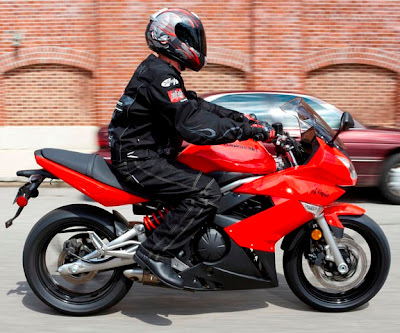 Before the redesign done, Ninja 650R has been comfortable, lightweight, upright ergonomics (easy use), and also economy. This feature does not make Kawasaki feeling satisfied, they make some major changes for the 2009 version. Among them, to enhance driving comfort, and also improve the modernization look. Revised Fuel Injection to improve the Response and improve Horse Power, Cooling System in its capacity increase. Major changes occur in the Frame to increase Stability, and reduce Engine Vibration. 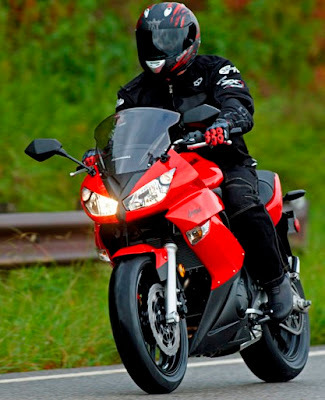 Total number of changes that occurred in 2009 Ninja 650R more than 40. Here is the complete press release from Kawasaki for 2009 Kawasaki Ninja 650R. 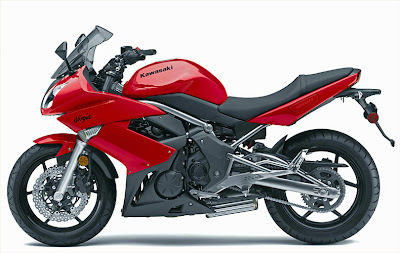 "The Kawasaki Ninja® 650R already epitomized the ideal marriage of sportbike performance and relaxed comfort. For 2009 Kawasaki improved on this combination and gave this popular model several new upgrades, from improved suspension to updated Ninja supersport styling. The end result of over 40 updates and refinements, the new sportier Ninja 650R delivers serious performance fun and maximum transportation practicality. 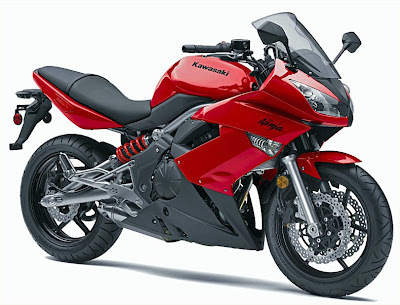 The key to the Ninja 650R's slender size is its compact liquid-cooled, fuel-injected, DOHC, 8-valve 649cc parallel twin engine, which permits the use of a narrow, lightweight frame. Revised fuel injection settings on this torquey engine boost its bottom-end torque, smooth low-mid rpm response and allow it to rev more quickly. Routing the coolant to the cylinder and head through the engine cases reduces the number of external hoses. The engine also meets stringent Euro-III emission regulations thanks to its precise fuel-injection and a three-way catalyzer system with a new 300-cell catalyzer that's smaller and lighter than the previous 200-cell unit. The non-intimidating twin-cylinder appeals to new riders, and has an excellent mid-range that offers enough pizzazz to thrill more advanced riders. A modified shift lever position permits easier application of the Ninja 650R's linear power delivery. The manageable power delivery and superb roll-on response enable the new Ninja 650R to make short work of the morning commute or perform as an entertaining track day companion - all while delivering good fuel economy. This spunky sportbike received several changes to the frame, swingarm and suspension that result in reduced vibration and lighter handling, making the new Ninja 650R more nimble and comfortable than ever. Its signature trellis frame and offset laydown rear shock design remains, but the frame was completely revamped and now sports a higher quality paint finish. The slim, compact trellis style chassis received more than cosmetic changes. Revisions to rigidity balance and suspension settings, and the addition of rubber upper-rear engine and handlebar mounts result in reduced vibration and lighter handling, enabling an improvement on the Ninja 650R's comfort and handling. Rider and passenger footpegs are now rubber coated to further reduce the amount of vibration transferred to the rider. The natural riding position and ergonomics are enhanced by a new slimmer and lower seat, which makes reaching the ground even easier than on the previous model. Surrounding the Ninja 650R's updated chassis is unquestionably sportier styling. From the wider windscreen and dual headers to the high-quality finish of the sleek minimalist fairings and covers leave little doubt about this Ninja's supersport genetics. Avoiding unnecessary design flourishes, the Ninja 650R's new sharper lines flow throughout the bike, giving it an aggressive appearance. Even with a new, taller fuel tank, the new fairing with integrated turn signals and a sharp tail cowl ably highlight this motorcycle's compact dimensions. Beyond its exciting appearance, new MotoGP inspired multi-function instrumentation and revised controls, the Ninja 650R is rolling proof that a performance motorcycle can be practical and comfortable. The rider may notice the slimness of the chassis, low seat height and minimal effort controls first before realizing the true aim of Kawasaki's design efforts - the rider. The Ninja 650R's friendly ergonomics provide a versatile cockpit that both novice and experienced riders will use to employ its assets to the fullest, from the daily commute to a weekend canyon run. In other words, this real world overachiever easily demonstrates its versatility and everyday usefulness. Authentic Kawasaki Accessories are available through Kawasaki dealers." * New, lightweight fuel pump mounted inside the fuel tank. For further details and specifications, visit Kawasaki. this is monster bike.. very cool.. like this brother.. This is a very attractive segment, gave me a lot of help, thank you for sharing, hope you can update more and better stories.One of my conclusions after having worked for over a decade translating research into practice is that the system of having academic researchers in one silo and learning professionals in another silo simply isn't working. Nice post. This post is different from what I read on most blog. And it have so many valuable things to learn. The Ninja 650R is a beautiful machine, and it’s humble enough to be at your service for whatever tasks you may want to assign it. If you’re a performance enthusiast, you won’t require another ‘small’ bike to take care of the daily chores, once you have this baby parked in your garage – it’s that practical. I found your post very interesting, I think you are a brilliant writer. I added your blog to my bookmarks and will return in the future. I want to encourage you to continue that marvelous work, have a great daytime! I am so grateful to read this wonderful post. Thank you for discussing this great topic. I really admire the writer for allotting their time for this impressive article. Nice to be visiting your blog again, it has been months for me! I think the image really summons the problems that every student are facing when it comes to keeping the concentration. Máy đo huyết áp Hay thật! Thế giới game hot nhất hiện nay, hãy cùng tai game avatar 222 mien phi về máy để cùng chơi nông trại vui vẻ với dế yêu. Một game online đang được yêu thích nhất, tai game iwin 270 – game đánh bài với game Liêng mới cập nhật vô cùng hấp dẫn. Hãy trải nghiệm một trò chơi vui nhộn, game chem trai cay đang được yêu thích. tai facebook cho dien thoai để giải trí với điện thoại, đây là ứng dụng hót nhất và đang được tải nhiều nhất, hãy nhanh tay tải về các bạn nhé. Chúc các bạn vui vẻ! download game fifa nhanh và đơn giản nhất. I am going to be honest here this publish is excellent! I learned a bunch of new, fascinating details. If you could send me your newsletter link, I would be very happy! Keep composing like this, and you will be well-known immediately. Avatar đã ra phiên bản mới với nhiều tính năng hấp dẫn, tai game avatar 222 mien phi là lựa chọn hay cho các bạn thích chơi những game nhẹ nhàng, hãy cùng vui với nông trại với nông trai vui vẻ avatar thôi nào. Game chém trái cây là một game mini cho android, game vui nhộn và đầy hấp dẫn. Hãy tải game chém trái cây về và chem trai cay thôi nào. Bạn thích chơi đánh bài hãy tai game iwin mien phi về máy, trong iwin có rất nhiều game đánh bài như: phỏm, tiến lên, Liêng,…. Và hãy tai ch play ve dien thoai về điện thoại để có thể tải về rất nhiều game và ứng dụng hot nhất hiện nay nhé.